Dr. Joshuah Sunggon Kim was born in Seoul, South Korea to a family of Christian parents and five siblings. He optained his B.S. from Sung Kyunkwan University and M.S. in Acupuncture at South Baylo University. In 1986 he came to the US to study biochemestry at Fairleigh Dickinson University in New Jersey. He returned to Korea for military service, then in 1996 decided to move back to the US. He worked first in Los Angeles then came to Arizona in 1999. Dr. Kim is a Licensed Acupuncturist. 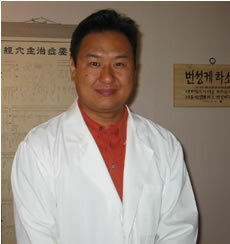 He has been practicing Traditional Chinese Medicine in the United States for over 20 years. Dr. Kim uses Acupuncture and Herbology to treat patients for a variety of conditions. In addition to his private practice, he teaches Tai-Chi and Qi Gong. “I do mostly what they call here in America, “Five Element Acupuncture” or in Korea, it’s called “Constitutional Medicine”. We divide human beings into four major and different groups, and those four different groups have different constitutions and different energetic qualities, which eventually result in many differences in ones personality, body-shape, eating habits, and digestive and elimination, as well as zang-fu organ patterns. My job as an acupuncturist is to know the four major constitutions i.e., metal, earth, water, and wood, and which constitution the patient falls into. This allows me to understand their chronic symptoms so that I can try to balance the patient’s inherent imbalances. For acute diseases or disorders, I also focus on treating the body by supporting its own healing ability and by enhancing circulation on blocked and or congested meridians where healing energy flows. He speaks fluent English and Korean. In addition to practicing acupuncture at his Holy Hill Acupuncture Clinic in Mesa Arizona, Dr. Kim also served as Clinic Supervisor at PIHMA (Phoenix Institute of Herbal Medicine and Acupuncture). He teaches acupuncture and Tai Chi classes and volunteers as a Christian missionary to the Hopi Reservation. Dr. Kim is married with two daughters; his moto is “Live for Others:”.